Clyde missed out on the chance to close the gap on their two promotion rivals on Saturday, thanks to a former Bully Wee player. With Peterhead and Edinburgh City locked together in a goalless stalemate at Balmoor, Danny Lennon’s side looked set to take advantage as they led at Annan thanks to Kristoffer Syvertsen’s first goal for the club. But with just three minutes left they were denied all three points as Kyle Bradley - who had a loan spell on loan at Clyde last season - fired in a strike which was deflected past Blair Currie. 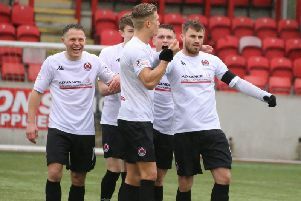 It was only the second goal conceded in seven games by Clyde who, although missing out on the win they wanted, did stretch their unbeaten run to 12 matches. The home side starting strongly and Currie came to his side’s rescue in the 10th minute, saving with his legs from Tommy Muir after the Annan man was put clean through. At the other end Clyde’s best chance of the opening quarter fell to Mark Lamont who blasted over from six yards. But the visitors did go in front in the 25th minute as Syvertsen drove forward before steering a low shot beyond the reach of Alex Mitchell. Clyde had an escape before the break as Currie pushed a Chris Johnston header onto the bar and Aidan Smith hit the post from the rebound. Ross Lyon had a chance to put Clyde two up in the second half, but his shot was just wide. And Annan made the most of that let-off to draw level on 87 minutes. Rangers loanee Bradley picked the ball up in midfield and his surging run forward ended with his well struck low shot from the edge of the box which took a fortunate deflection past Currie.